St Francis Xavier College is a co-educational Catholic College (Years 7-12) in Florey, ACT. From the mid-90s the school offered uniform options, in terms of pants and shorts, and from early 2000 shorts were encouraged for both boys and girls. There was a period of time where boys were reluctant to wear shorts, despite the fact that they had always been part of the uniform. Almost every boy was wearing long pants, even throughout the hot summer months, and despite the misconception about how cold Canberra gets, we also get very hot days in the summer! In an effort to bring about some cultural change there was a push for shorts to be worn, and to be equitable, it was decided that the similar uniform options would be created for girls. In Years 7-12 the uniform for girls consists of a school dress, pants, skirt, shorts, shirt, jumper, and jacket. For Years 7-12 the uniform for boys consists of school pants, shorts, shirt, jumper, and jacket (and a blazer is an optional extra for senior students). 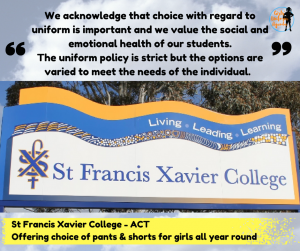 Since that time we acknowledge that choice, with regard to uniform, is important and at St Francis Xavier College we value the social and emotional health of our students. We understand the diversity of our student community and we want them to feel empowered to make the choice that’s right for them, and be comfortable in their uniform at school. Many girls wear pants as their uniform of choice during the coolers months, and fewer wear shorts in the summer time. All girls and boys wear shorts and a polo shirt in their Physical Education class. For many years the uniform options have been wide and varied, even to the extent that girls can choose to wear their summer dress or shorts in winter. It’s always been part of who we are, where the uniform policy is strict but the options are varied to meet the needs of the individual.